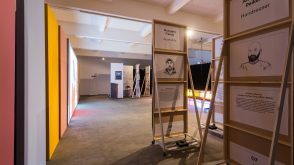 Chisenhale Gallery presented a major new commission by the Istanbul, Amsterdam and Berlin based Kurdish artist Ahmet Öğüt. For Happy Together: Collaborators Collaborating Öğüt staged a public discussion at Chisenhale Gallery, bringing together people of various professions and nationalities with whom he had previously collaborated. 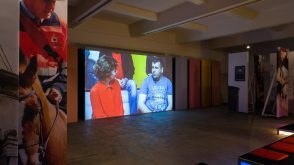 The gallery was transformed into a TV studio for the duration of the exhibition with a specially constructed set used to stage the discussion and, afterwards, to present a film documenting the event. The project opened with a performance of Reverb, a concert by the artist in collaboration with the band Fino Blendax, to welcome the collaborators to Chisenhale. 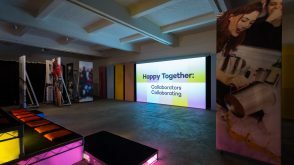 Happy Together: Collaborators Collaborating was a new work, comprising a live event and a film installation, but it also functioned as a form of retrospective, collectively formed through the memories and experiences of Öğüt’s collaborators. Ten collaborators, including an auctioneer, a firefighter, a hairdresser, a stuntman, a lip reader and a sports caster, were invited to Chisenhale Gallery to share their experiences of collaborating with Öğüt and to collectively generate a new idea for an artwork on behalf of the artist. The collaborators took the stage whilst Öğüt positioned himself amongst the audience. Revisiting past collaborations in this new work, he explored the agency of those who participate in a work’s production and the nature of collaboration itself. Collectively Öğüt’s collaborators represent a selection of his work spanning almost a decade. A Berlin-based barber, Alexander Peikert, represented the earliest project: Another Perfect Day, first presented at Pist, Istanbul in 2006, with subsequent presentations at the 5th Berlin Biennale (2008) and Sofia Contemporary (2013). Peikert cut hair by the light of a motorcycle headlight in a performance that made reference to the creativity and improvisation employed in the everyday lives of people living and working in unstable political and economic environments. Some of Öğüt’s most recent work was represented by Amsterdam based mixologist Tess Posthumus and London-based musician Deniz Belendir of Fino Blendax. With this highly experimental exhibition format, Öğüt revisited some of the work for which he is best known. For Fahrenheit 451: Reprinted (2013), Öğüt reversed the role of the fire fighters in Ray Bradbury’s eponymous novel from 1953: instead of burning banned books, they were printed and distributed from a re-purposed fire truck by members of the Fire Department from Espoo, near Helsinki, one of whom – Jaakko Liesivouro – took part in the event at Chisenhale. The Silent University is a knowledge exchange platform initiated by Öğüt in 2012 and operated by asylum seekers and refugees who are legally prevented from carrying out their professions in the countries where they are currently based. It was represented at Chisenale by Mulugeta Fikadu, an Eritrean-Cuban physiotherapist based in London. Öğüt often employs humour to address complex issues, weaving loose narratives that connect collective memories, local histories and cultural identities. His work is rooted in the reality of everyday life and he uses the symptoms of social and political ideologies, systems and histories to produce ambitious projects that enact subtle shifts in perspective. In Happy Together: Collaborators Collaborating, Öğüt foregrounded the status and value of labour within the production of art, provoking a critical consciousness that calls into question the ethical and relational implications of the role of the artist and their work within the world. The public discussion at Chisenhale Gallery was chaired by Andrea Phillips, Reader in Fine Art and Director of PhD programmes in the Art Department at Goldsmiths. The film of the event was produced by the UK educational charity WORLDwrite, which encourages young people to use film and new media technologies. Ahmet Öğüt (born 1981, Diyarbakir, Turkey) is a Kurdish artist living and working in Istanbul, Amsterdam and Berlin. Recent solo exhibitions include We Won’t Leave!, Parking Gallery VANSA, Johannesburg; Apparatuses of Subversion, Horst-Janssen-Museum, Oldenburg; Strategies for Radical Democracy, The Blackwood Gallery at University of Toronto (all 2014); and Fahrenheit 451: Reprinted, Checkpoint Helsinki (2013). He has participated in numerous group exhibitions, including 8th Shenzhen Sculpture Biennale (2014); Performa 13, New York (2013); 7th Liverpool Biennial (2012); and the 12th Istanbul Biennial (2011). Öğüt was artist in residence at the Rijksakademie, Amsterdam, 2007–2008, and at Delfina Foundation, London, in collaboration with Tate, 2012. He has taught in Dutch Art Institute, Netherlands, 2012 and the Finnish Academy of Fine Arts, Finland, 2011 and 2013. His solo exhibition, Forward, opened at the Van Abbemuseum, Eindhoven, in March 2015. This commission has received additional support from Saha Foundation, the Mondriaan Fund, Maya Rasamny and Yana and Stephen Peel. With special thanks to Panalux and Acre Jean.